It’s the weekend and you need protein and a mimosa stat. 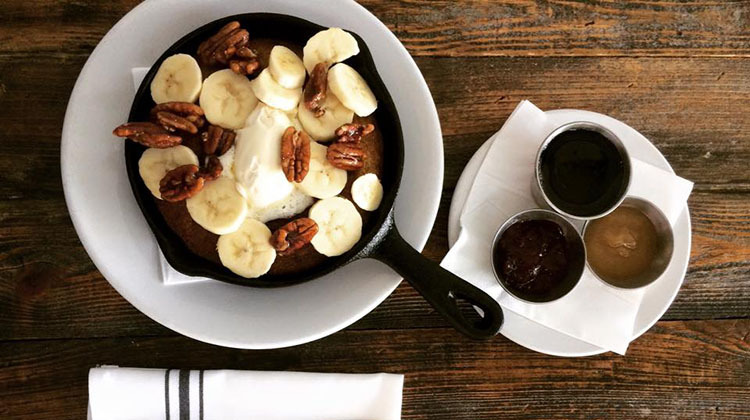 Thankfully, if you’re looking for brunch in Salt Lake City, you’re in luck. We have a bajillion (its a word, trust us) options across the valley. Salt Lakers love their brunch! Here are our ten picks for the best branches in town. Check out these shots, hungry yet? 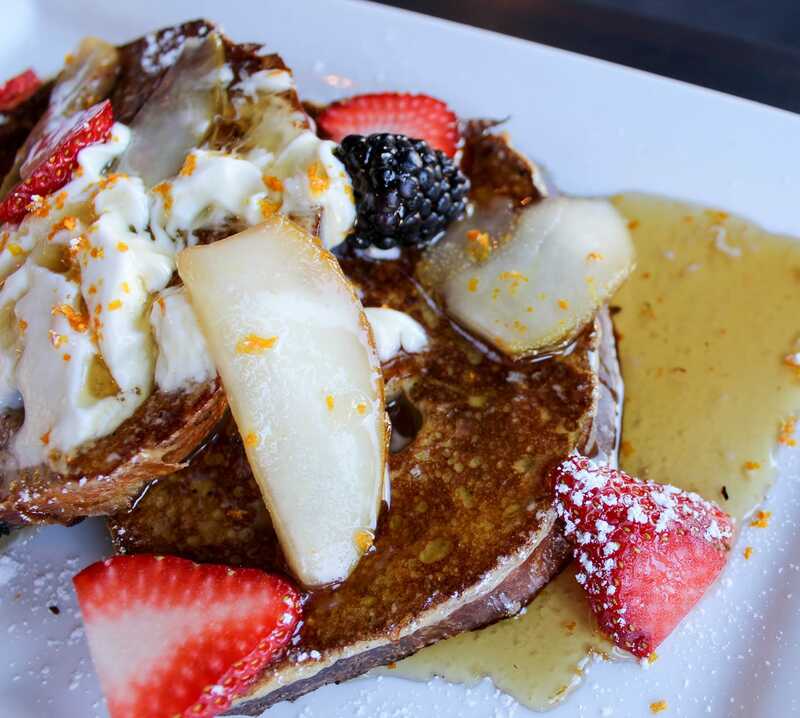 Make sure to do brunch the Proper way and head up to this Avenues’ neighborhood hotspot. The restaurant is a local’s favorite for brunch and serves this most important meal of the weekend on both Saturday and Sunday. Start with a $3 (yes three dollars) mimosa or bloody Mary then kick back and review Avenues’ extensive brunch menu – a selection of classic dishes, each with Avenues’ own unique spin. Everything is plated beautifully and sourced from the best local ingredients where possible. A couple of our favorites on the brunch menu? 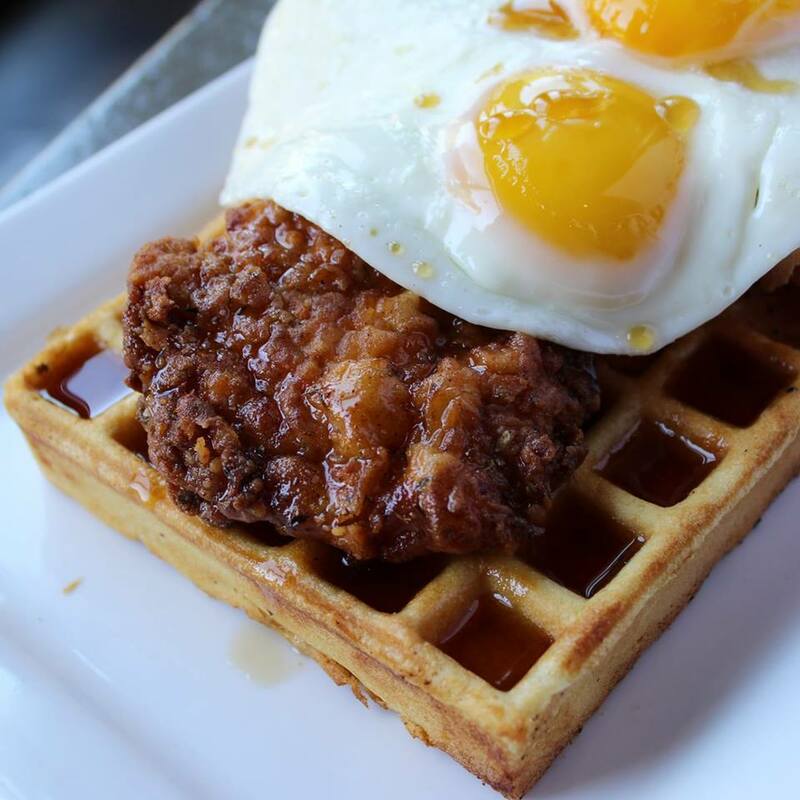 Try the Chicken & Waffles, featuring house made chicken sausage and 2 eggs sunny-side-up. Plated atop golden brown waffles and drizzled in fantastic, thyme-infused grade A maple syrup. Or perhaps the Southwestern Benedict is more your style? 2 poached eggs come with crispy cornbread, kale-bell pepper-red onion hash, pickled jalapeños and pico de gallo hollandaise. 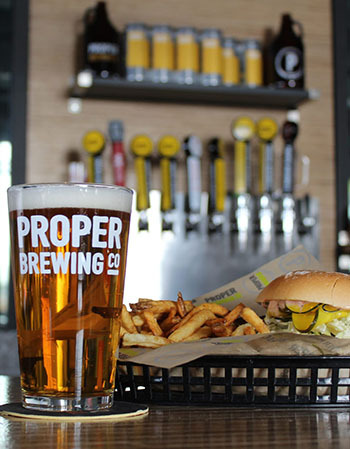 And if you find that brunch runs into a lazy, luxurious afternoon, don’t forget the restaurant is home to an excellent micro-brewery, replete with some of SLC’s best ales, beers and lagers. Brunch served Saturday and Sunday 10 a.m. – 2 p.m.
We’re proud to have Avenues Proper as the sponsor for this page. Speaking of which, we’d be remiss to not mention thus other outpost from the Proper brand. 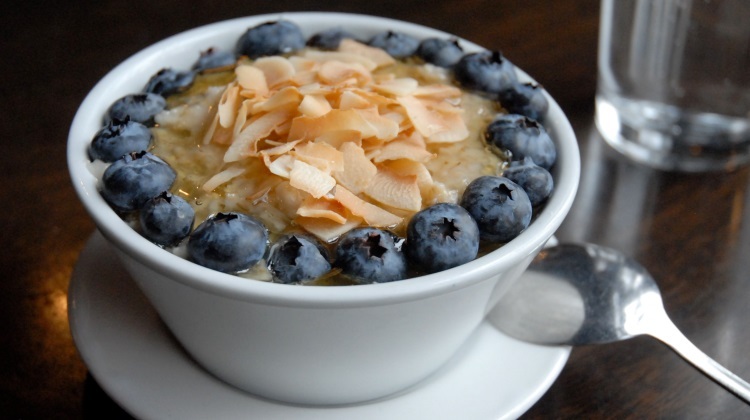 The same savvy operators run this cozy East side eatery, which also has fabulous brunch items. 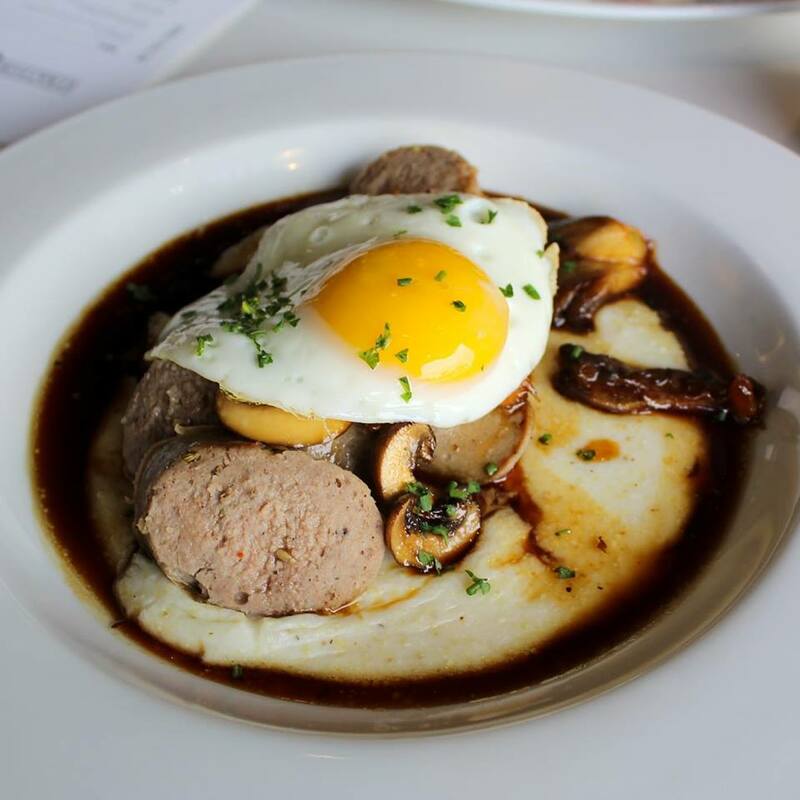 The Stratford Proper brunch menu is served every Saturday and Sunday 9 a.m. – 3 p.m.
Reservations are always a good idea for brunch in Salt Lake City, but they’re a must at this gem Opening in 2017 this contemporary American restaurant has become an instant hit with diners all hours of the day. At brunch you’ll find all your favorites plus their signature pies – which you can’t leave without ordering a slice (or four). 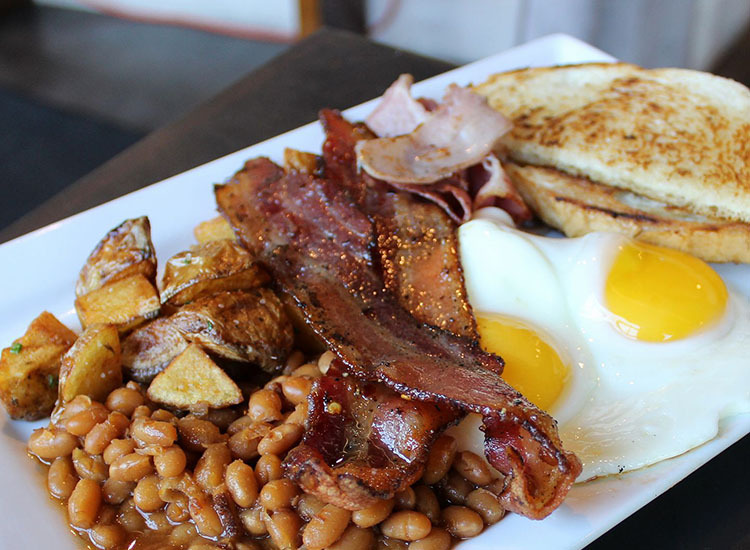 Brunch served Saturday and Sunday 10.00 a.m. – 3.00 p.m.
There’s something for everyone on a brunch and lunch menu that stretches from a classic American breakfast to indulgent bites like the chocolate chip, raspberry French toast. The only downside? 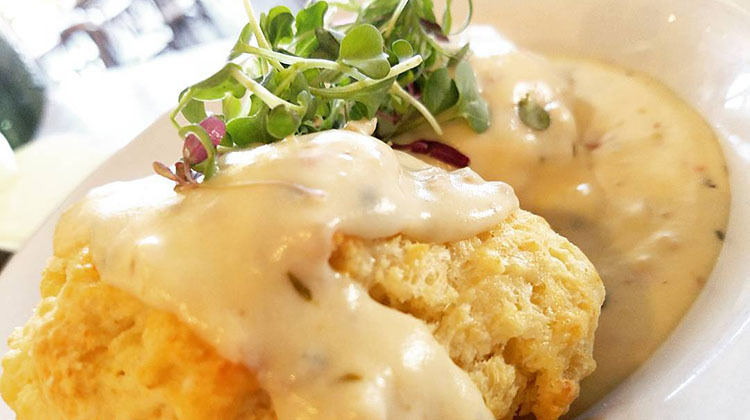 Having to choose from a menu that presents options as delicious as Kobe beef corned hash or biscuits and gravy, with house made cheddar jalapeno biscuits. Brunch served Saturday and Sunday 8 a.m. – 3 p.m.
What about a sprinkling of Greek flavors for brunch? At Manoli Katsanevas’ central ninth eatery you’ll find a weekend brunch menu infused with unique flavors: Myzithra Pancakes, Lamb Burgers, Loukaniko and Eggs and more. And if that name sounds familiar you’d be right, the Katsanevas family is the one behind the uber popular Crown Burgers group of restaurants. 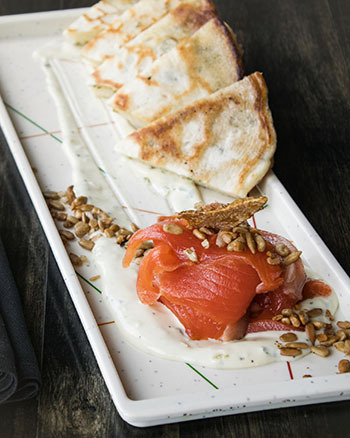 Unique, locally sourced Greek small plates, plus weekend brunch & clever cocktails in modern digs. 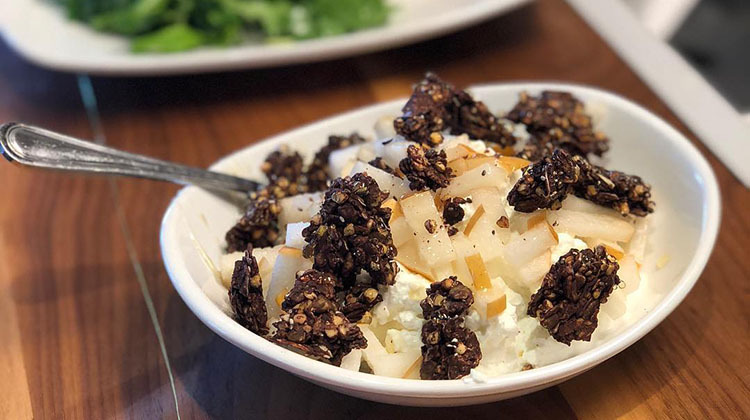 Brunch is served Saturday and Sunday 10.00 a.m. – 2.30 p.m.
An SLC innovator that was one of the very first restaurants to bring small plate dining to Utah. As owner and head chef Jen Gilroy spent her formative years in the South, you’ll find plenty of nods to classic comfort food on the menu here. 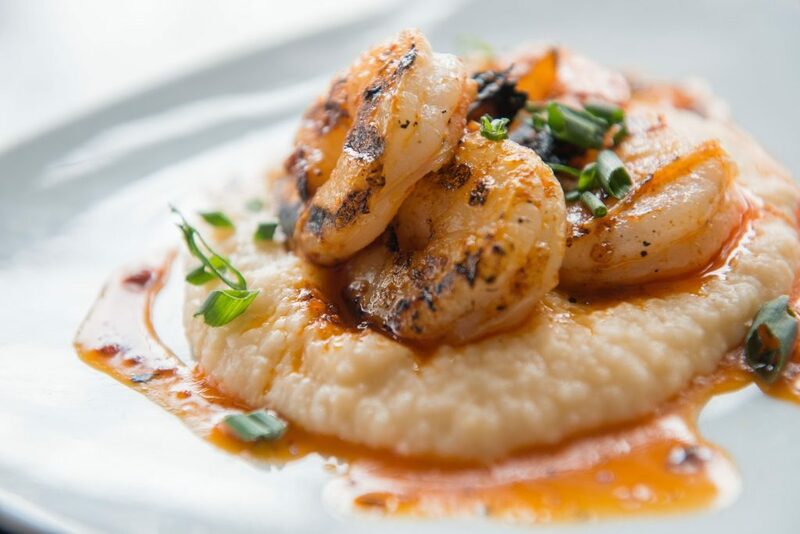 Check out the spectacular shrimp and grits for one. Brunch served Sunday from 10.30 a.m.
At this self styled ‘oasis in the heart of the city’ brunch isn’t just something for the weekend. Step inside Oasis Cafe’s tranquil space and you’ll find brunch every day of the week. 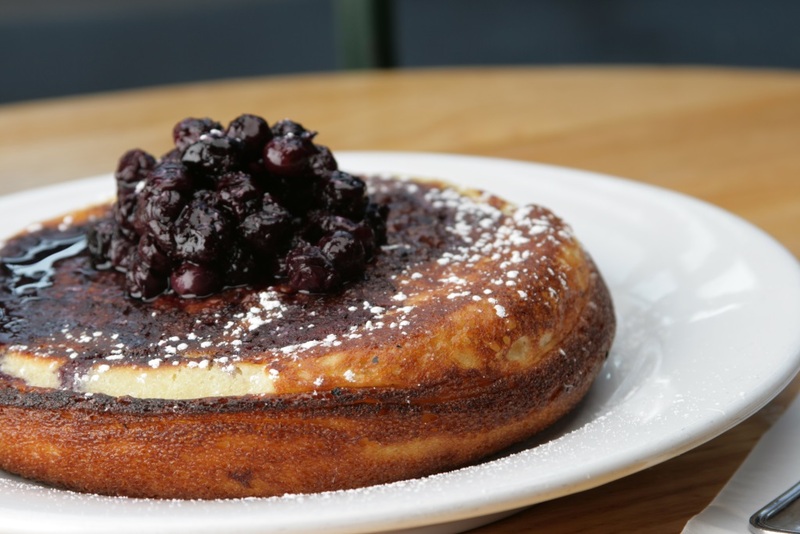 Favorites include the pictured German buttermilk pancake with blueberry compote. Brunch served every day until 2.30 p.m.
Over in Daybreak Utah you’ll find another restaurant by Jen Gilroy, and another mighty fine destination for brunch. Like Meditrina there’s bags of Southern charm here but there’s plenty other dishes to love too, Grilled Bavette Steak and Eggs anyone? 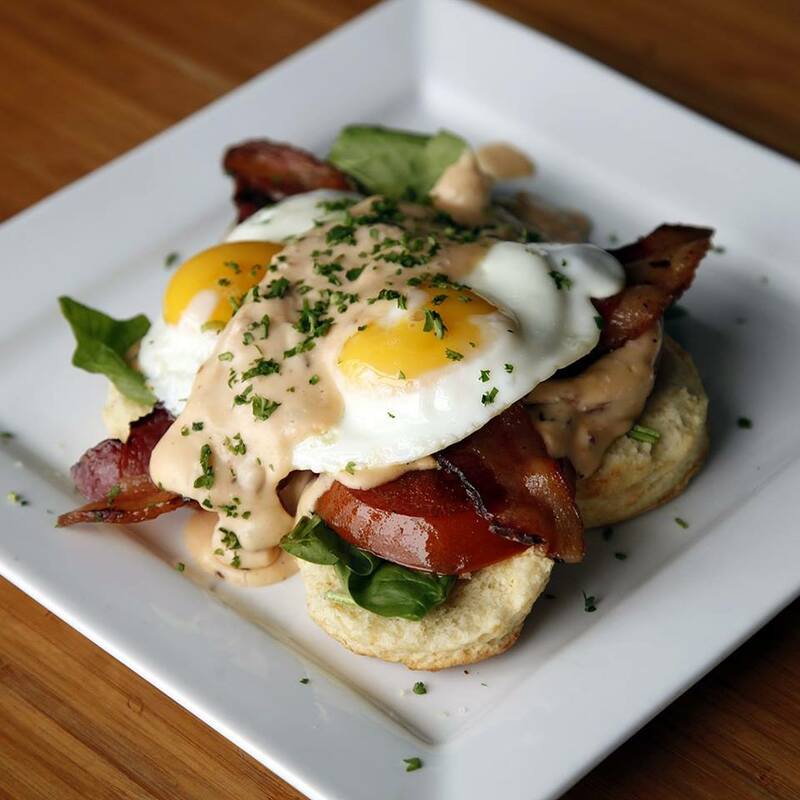 Brunch served Saturday and Sunday 10 a.m. – 4 p.m.
One of the Salt Lake City Farmer’s Market success stories; the business moved into a proper bricks and mortar location after wowing Salt Laker’s with their biscuits. 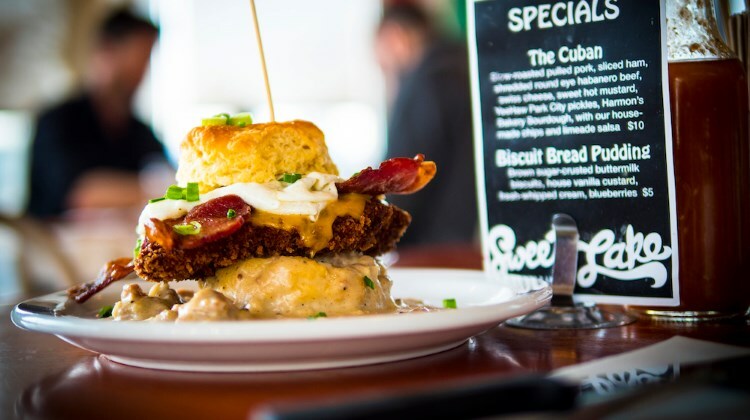 People still flock here for the biscuits and also the crazy creations such as the picture Hoss – a biscuit topped with fried chicken breast, egg, bacon, cheddar, sausage gravy and green onion garnish. Brunch served Saturday and Sunday from 7.30 a.m.
South of the border cuisine crafted with creativity and care will make you rethink what brunch can be at Taqueria 27. Dishes like Spicy Fried Chicken and “Donuts” ($10, crunchy chicken breast atop fresh “donuts”, agave infused pure maple syrup, crispy camotes) and Citrus Pork Carnitas Slow roasted and shredded, charred tomatillo salsa pickled red onion, cilantro and chicharone’s, two $6, four $11) are just two delicious choices from this award winning restaurant. Brunch served Saturday and Sunday 11.00 a.m. – 2.00 p.m.
What time can I get a drink at brunch in Utah? Thinking about getting a drink with brunch? Utah restaurants can legally serve you the good stuff starting at 10.30 a.m. on Saturdays and Sundays, provided you’re ordering food of course. Check out our guide to Utah liquor laws and our guide to the best mimosas in town as well. Should I get a reservation for brunch? Definitely! You’ll find that weekend brunch is one of the busiest dining periods for restaurants in Salt Lake City. If you want to avoid waiting in line, we’d recommend calling in advance to guarantee your table and time. I heard that everywhere is closed in Sunday in Utah? While that might have been true way back when, the truth is that these days there are 100s of restaurants open on Sunday. Breakfast, brunch, lunch and well into the evening, there’s a myriad of options. 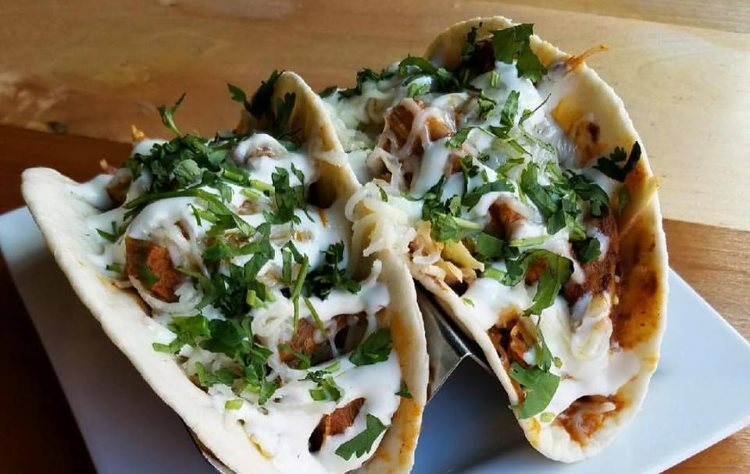 For a full run down of the many restaurants open on Sundays Utah, check out our sister site SLC Menu and their guide to restaurants open on Sundays. If you can’t find anything on that mega-list, well, you’re probably not really hungry!